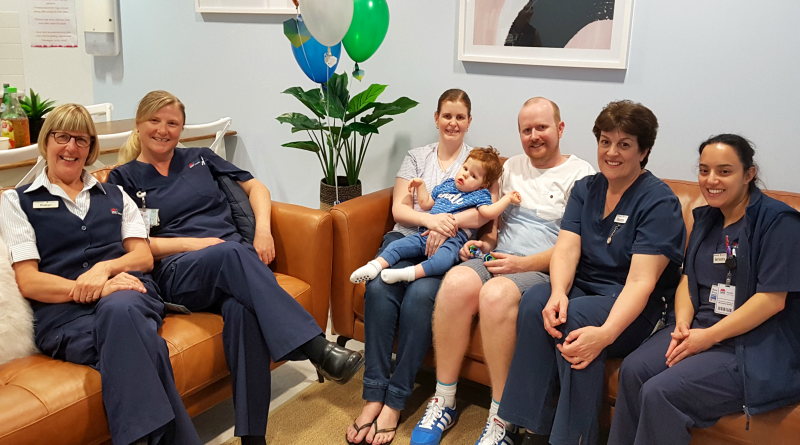 The Dogao family celebrate the opening of the refurbished parents’ room with their son Noah and staff from Westmead Hospital’s NICU. The newly renovated parents’ room at Westmead’s neonatal intensive care unit (NICU) is officially open and the transformation is very impressive! The fabulous makeover was thanks to a $13,000 donation from grateful parents Anne Marie and Chris Dogao, whose son Noah was cared for at the ward shortly after birth. To celebrate, Noah was in charge of the ribbon-cutting ceremony to officially open the room. Anna Marie and Chris donated the funds to Westmead Medical Research Foundation (WMRF) from a trivia night they organised. NICU nurse Lorraine Wakefield, who helped with the refurbishment, said parents needed a calming environment in difficult times. “Mothers and families of critically ill newborns spend days, weeks and even months at the unit,” she said. Siblings and fathers of the newborns are allowed to visit the ward 24/7, and thanks to the Dogao family, they can now enjoy a comforting area that feels warm and homely during their time at NICU. For more information about supporting WMRF by hosting a fundraising event, contact Marlene Nasr, community relations & events manager on 1800 639 037.